Fun ideas that will bring the garden to life for your party guests. 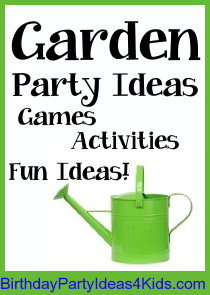 Garden themed games and activities along with decorations, favors, invitations and more. 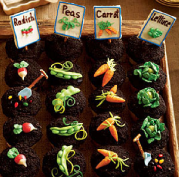 Garden theme birthday party ideas for kids. Attach a small card or postcard with the birthday information on it to an artificial flower with a pretty ribbon. Print party information on large labels and stick onto the back of seed packets. Ask guests to bring the seeds with them and set up a seed planting station with small terra cotta pots and soil where they can plant their seeds and take them home as a favor. Decorate the party table in bright colors such as yellow, pink, orange, blue and green. Buy large yellow plates and set them out on the party table at everyone's place. Underneath the plate place a colorful doily that is larger then the plate to look like petals of a flower. Line the walkway with lots of flowers and greenery. Or make a balloon garden by twisting colorful balloons into flowers and using a green balloon to twist into the stem and leaves. Tie them to stakes and place them along the path to the party. Decorate the party table with flowers in different colorful pots. Utensils and snack foods can be set out in new terra cotta pots with a bright ribbon tied around them. Small wheelbarrows and buckets can be used also. A Garden Scavenger Hunt is fun for all ages! Give the party guests a list of items to find, a plastic baggie and a spoon and send them off to explore the garden. For complete directions see our Nature Scavenger Hunt - also includes a free sample item list. Set out a lovely Tea Party in the midst of your Garden party with these fun Tea Party Ideas from our website. Make your Garden party picture perfect with this craft. Buy wooden photo frames at the craft store and set them out for the kids to paint. Set out paint brushes and bright colored paints. Let your guests start their own garden with this clay pot craft. Buy small terra cotta pots at the craft or discount store. Set out paints and paintbrushes along with the pots at the party and have the kids paint their terra cotta pot. When they are done and the paint is dry fill the pot with soil and add let them add a few flower seeds. A fun treasure hunt that kids of all ages like to do at parties. Buy lots of small plastic flowers or bugs and hide them around the party area or backyard before the party starts. Give each guest a butterfly net (or a paper sack will work) to collect as many flowers and bugs as they can find. If they want to play again (and they will!) divide the kids into two groups. One group will hide the items first and the other group will find them and then they will reverse so everyone gets to hide the items and find them again. Tear Drop Cookie Cutters can be used to cut out a variety of food and when the tear drops are placed in a circle they look like flower petals. Cut out a variety of foods and arrange plates to look like a food flower garden. These foods all work great and will give the party a splash of color - slices of oranges, apples (toss with a little pineapple juice first to prevent them from turning brown), kiwi (makes great leaves), sugar cookies, brownies, etc. You can also cut whole sandwiches with the cookie cutters. sugar cookies, brownies, etc. You can also cut whole sandwiches with the cookie cutters. sugar cookies, brownies, etc. You can also cut whole sandwiches with the cookie cutters. Garden cupcakes. These are fun for kids to eat. Make them ahead or have the ingredients set out and let the party guests make their own. Fill a cupcake liner with chocolate pudding (the dirt) about half way. Crumble Oreo cookies and put them on top of the "dirt". Stick gummy worms half in and half out of the pudding and top with flower sprinkles.